One of the most stressful things that can happen to anyone is finding themselves charged with a crime. What are you supposed to do next? Will you have to spend time in jail? Who can help you through this traumatic and complicated time in your life? I can help–and I am here to assist you in any way possible. I am Schoen Parnell, a Snohomish criminal defense attorney who has been representing defendants for nearly 20 years. With a stellar track record of helping my clients hear “not guilty” verdicts in hundreds of criminal cases as diverse as domestic violence and felony assault to weapons charges and vehicular manslaughter, I offer the expert assistance of a lawyer who knows exactly what to do to defend you and your rights. As a seasoned criminal defense attorney fighting for my clients’ rights in Snohomish County, I have seen the difference it makes when someone is represented by a public defender. Although a public defender is definitely preferable than having no representation at all, these defenders are underpaid, overworked and burdened by heavy caseloads. Consequently, they cannot give your case the minute-by-minute attention it needs so that you benefit from the the best outcome possible. In addition, all clients have direct access to me at all times. When you call my number,I will answer the phone, not a secretary, paralegal or office temp. I also make a point of limiting my case load so I can give your case all the attention, time and thought it deserves. As your criminal defense lawyer, I will be there when you need me and promise to defend you aggressively in court, using in-depth knowledge of the Snohomish County court system and past experiences. Snohomish does not have it’s own courthouse or prosecuting attorney. If you are arrested in Snohomish, WA for a misdemeanor or gross misdemeanor offense your case will be heard in the Snohomish County District Court Evergreen Division’s courthouse located in Monroe, WA. If you were arrested by a Snohomish city police officer your case will be prosecuted by a private firm whom the city contracts with named Zachor & Thomas. However, if you’ve been charged with a felony or arrested by a Washington State Trooper or a Snohomish County Sheriff Deputy, your case will be considered a State case and prosecuted by the Snohomish County Prosecuting Attorney’s Office in Everett. 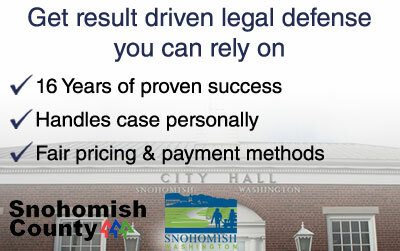 Felony state cases are held in the Snohomish County Superior Court located in Everett, WA. Both courthouses book their inmates into the Snohomish County Jail located in downtown Everett. If you have any questions about your arrest in Snohomish, WA don’t hesitate to reach out to me anytime day or night.